Today I woke and felt much better, still a bit tired though. I managed to clear up the house a little, and pulled out a few weeds in the garden while Mas had to go off to a meeting. Later we decided to have a change of scene, and went off for a fish lunch and collected some shopping. I cannot believe I feel so well today, and did not take the special anti nausea medication. Diane called as she had been concerned at how strange I had sounded yesterday when we spoke, and was reassured that I am back to 'normal' again. 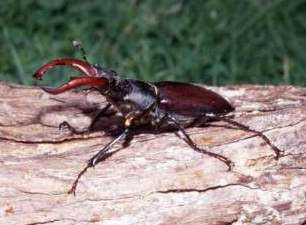 She mentioned that she had found a large stag beetle in her garden which had cheered her up. I remember when I was a child my father had some stag beetles in an old aquarium as he was doing illustrations of them for a book, and we kept them as pets for a long time. In the end there were so many of them that we decided to release them on Hampstead Heath which we sadly did, emptying them out into a patch of the woods on a dismal afternoon. Each time we passed the spot on walks we looked for them, but never saw them again. Thursday, Friday and Saturday passed in an increasing blur of nausea and exhaustion. Pete phoned from Guernsey telling me where he had been, who he had seen, and what he had been doing while he was there, and made me feel I was there too. On Saturday I phoned the hospital about the nausea which had become intolerable by now, and they asked me to come in on Sunday morning and they would give me a prescription and pills to help me. Mex phoned telling her news and initiating me into some of the mysteries of Twitter.com. Tobe sent an email saying they were about to leave for their holiday in Argentina. On Sunday morning all the tube lines were disrupted, so Mas drove me to the hospital. Luckily the roads were fairly clear of traffic. The doctor was very sympathetic and I soon left with the new medication. As advised I took ¼ of one of the pills; immediately I felt as if I had been poleaxed! I had to go straight to bed and spent most of the day asleep, and if I tried to watch television it was the same; I just slept through it! The nausea however disappeared. Mas cut the lawns, and he said as he was emptying out the cut grass found a little mouse hidden in the dry grass at the bottom which startled him. It immediately ran under the hedge and away. We went early to bed, and I slept as if anaesthetised all night, and woke with a sore throat so think I must have been snoring too! Yesterday I went off to hospital bright and early and had another chemo. session. As usual everyone was helpful and pleasant, and I also had a complimentary foot massage while I was having my treatment and the lady who was doing it was very interesting to talk to as well. At the end of the afternoon I went home and Mas collected me from the station. I felt tired and was having lots of weird sensations, and after dinner and watching a Frasier I took myself off to bed early, and Mas soon came up to bed too. Today I woke feeling much better and we decided to go off to St. Albans as usual and get shopping and to meet Tania and Robert in Sazio's for lunch. Mas bought a really comfortable pair of shoes. As it will be Robert's birthday soon he bought a bottle of wine for us to celebrate the occasion with. 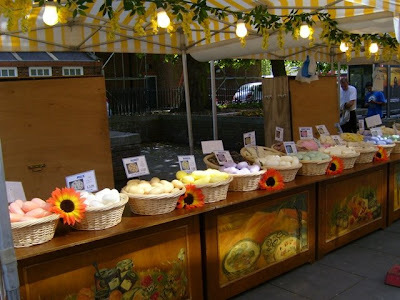 Afterwards we walked through a French Market which visits St. Albans now and then and looked at the different soaps and dried and preserved fruits. Pete phoned from Guernsey; he had been doing all the usual familiar things in St. Martin's, and while he phoned was waiting for the bus to take him to Town to meet up with Poppy and Ben. Mas went off to get a little more shopping and we had a relaxed evening. On Thursday I walked to Edgware, got a little shopping and posted letters. After lunch I did a bit more gardening and then we went off to meet Tania and Robert for a meal in Stanmore where we chatted and had a curry meal. It was a nice change of scene and company and made a welcome break. 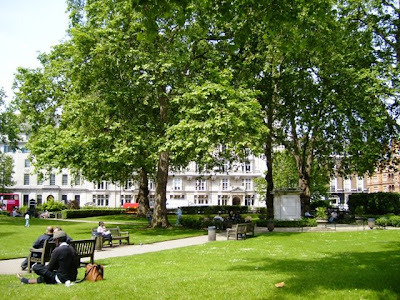 On Friday I went back to Oxford Street and cut through Cavendish Square to the dentists for a final session, before returning home again. We had a quiet weekend; I talked to Pete for a while and for a break Mas and I watched Monk. I usually colour my hair a kind of warm mahogany brown, but decided I would use a more natural product, so in preparation I cut my hair,(as it happened rather short,) and then put the mixture on. I think I left it on too long, as it is now very dark brown, and what with the short hair it looks as if I have bought myself a smart but rather severe wig. It became very windy on Sunday but I managed to get in some more gardening, and talked to Diane too, and Mas made a really nice dinner. Our neighbour's garden: he has cut down the painted dead tree and put in a small group of garden gnomes and solar lights of stars and butterflies, around the edges, which rapidly change colours all the time when it is dark. Today I thought I had better tidy things up as I will spend tomorrow in hospital again. By chance I was in the garden putting clean water out for the birds and a big bird landed in the garden and began dragging its wing; I thought for a moment it was damaged, but after looking at me for a while it flew off, so it must have been a distraction strategy. It was carrying a mouse or small bird. I had not seen such a bird before, and looked it up in our bird book; I think it was a Kestrel. The weather today is sunny and 20 degrees in the shade, a perfect summer's day. Margaret and John phoned and invited us to tea, so Mas and I spent several peaceful hours sitting in their lovely garden. They have turned over the major part of their back garden to growing fruit and vegetables of which they have a huge variety, and have lots of bird feeders too so we were watching them come and go while we chatted and had tea, cheese, biscuits and fruit. We left with two lettuces, some rocket and lots of fragrant parsley. This morning I showed Mas the pictures Jana had sent of her 'walking' holiday in Spain with her brother and friends. The photographs seemed of the quality that The National Geographic magazine would use, and some were absolutely stunning. Some of the pictures showed them climbing up bare rock faces, or walking along non existent ledges with precipitous views; after each of these, Mas who does not like heights, uttered an involuntary, four letter word, expletive in horror. I spoke to Monika briefly this morning, and then I had to go off for another treatment at the dental clinic; it is such a friendly place. I notice on the tube that there is an advertisement for a free concert in Leicester Square on June the 30th as it is Canada day here; the musicians are Canadian. Monika, Oktay and the children called in to see Mas as they were in the neighbourhood, and he said they all looked cheerful and happy; Monika will be off to Czech for a month's holiday with the children soon. I had a rest when I got home, and Diane called and chatted for a while. Mas made me a lovely fish dinner before we relaxed for the evening. More dental treatment and home again. 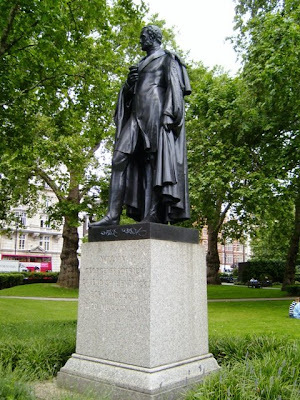 through Cavendish Square, and caught the tube home at Oxford Street. When I got home, after resting , I did a little cleaning up and Mas made dinner. The evening light looked so nice that I had to take this picture from the kitchen window, which happens to overlook the road at the front of our house. We watched an episode of Pie in the Sky and a Frasier. Pete phoned a bit later, and then we went to bed fairly early. Saturday and Sunday were fairly uneventful. The weather was very nice and we spent some time gardening, sitting in the garden, doing housework and generally catching up. I made some emergency rock cakes to take to the dentists as I have to eat at a special time so I can take the chemo pills. Diane phoned to sadly cancel her visit on Sunday as she felt tired, and had a hectic week. I spoke to Pete and caught up a bit with Toby which was nice. I got an email from Jana with wonderful pictures of her holiday in Spain, some of it was mountain climbing, not just walking! We watched a bit of TV, filling in with Frasiers. Today we got up horribly early, and I got to the station at 7.30am and I bought some water to wash my pills down with later. I got to Oxford Circus in good time, despite it being rush hour on the tube, and had time to eat the cakes and take my pills sitting in the sun in Cavendish Square where others were drinking coffee. I looked at the food in John Lewis' and after seeing the prices of the different breads decided when I am better I will make my own again as I used to when Pete and Toby were young. I went home the scenic way, on the bus, and then relaxed most of the day. Taking care on Friday the 13th! I woke in the night feeling shivery, took my temperature which was raised at 5.00am, but next morning it was normal again; I thought it was the new antibiotics. I phoned the hospital, and they told me to come to the Accident and Emergency department which I did. I saw the same nice doctor I had seen on Tuesday, who did lots more tests and examined me again, and took more blood samples ( I began to feel like Tony Hancock in 'The Blood Donor, and imagined that lately I must have used up one armful of blood on tests ). The doctor told me that I could not have any surgery until he had confirmed my white blood cell count was not too low. As all my blood counts were good, he spoke to my caring dentist to tell him the position, and called the specialist as well, and that the dental care must be done straight away. This took a long time, but I left the hospital feeling very confident that I was really being looked after. Got home again, and found the dental specialist had already called and made me an appointment for 9.00am Monday morning. We then relaxed and caught up with a few emails before having dinner and watching TV for a while. We got up and had a cheerful breakfast together, and Pete and I played a game of Carcassonne which was fun, and Pete won. We were not quite sure what to do with 'the farmers', but somehow it was a relief to find that they are placed lying down in fields. We will improve with practice. Mas took me to the dentist again; he gave me more antibiotics and advised I see a specialist which he would arrange. I am so impressed with the care that they are showing me. Impressive male duck with a brood patch on his chest. We returned home, after collecting the new medication, to find Pete had vacuumed and tidied up, which was nice. 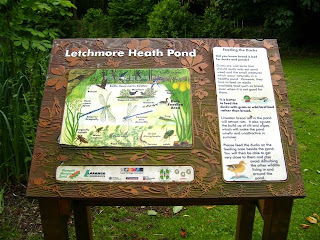 We went to Letchmore Heath to the Three Horseshoes for a pub lunch and had a cheerful meal together. 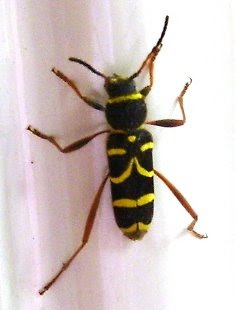 I became fascinated by a strange insect which I took for a beetle as it had no visible wings, but looked like a wasp, I had never seen one of these before. It was going up the inside of the window as we left, and I tried to catch it to release it outside, but it was too high for me to reach without standing on a chair. Pete got it and we took it outside and I tried to photograph it on his hand, but he kept saying it was biting him, so the picture was out of focus, but it was funny. Yesterday I had to go for a blood test at the Royal Free, on mentioning that I was a bit breathless after walking a mile a very thorough doctor did a battery of different tests on me, an ECG, chest x-ray, blood tests and the most thorough medical that I have ever had. All the tests showed that I am really very healthy which was very reassuring. It did take all day though. Mas for his part had his teeth polished by the hygienist, and was very impressed by her. Both of us felt a bit tired and we went to bed early. Today we went to St. Albans, the drive was really lovely as the countryside is particularly beautiful at this time and it was a sunny day. 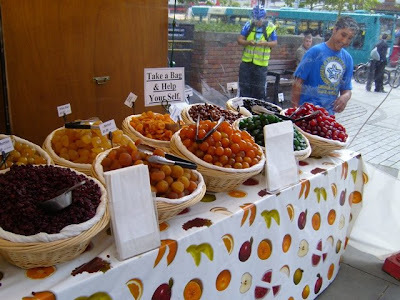 We bought fresh fruit and vegetables and then met Tania and Robert for lunch as usual in the Thai restaurant. Robert and Tania were both a bit under the weather, but we had a really nice meal and some laughs. The owner took me aside and suggested I use meditation to help me get better, and advised singing inside without a head as a good method. This presented various pictures to my mind and I resolved to think about it later. We drove home and had a quick rest, and I discovered that the dentist had left a message to contact him. I did, and it was arranged that I call in tomorrow and he would review my tooth. Pete arrived as planned, we had a really nice dinner which Mas prepared and we spent a nice evening together listening to Toby's jazz compilations and talking. All of us felt tired so we went off to bed fairly early. Today was hot and sunny so we thought we would push on with the gardening while it was nice. Diane phoned which was nice and we arranged that she would come to us for Sunday lunch. Christiane called in the morning and we arranged to all meet up at The man in the Moon for a meal. We met as planned with Christiane, Eddie, John and Margaret. A different manager was on duty, so everything was as nice as usual. Eddie had bought a huge pile of coupons which were offering various meals at reduced rates, so confusion reigned while everyone decided what to eat. Eventually we settled down and enjoyed our meal and the conversation. Sadly I had to break it up so I could return home and take my pills at the specified time, but it had been a fun evening. I took my pills, and we sat in the garden for a while as it had been so nice yesterday. Later we watched a couple of Frasiers; we are stretching them out by only watching two episodes a night. Ben and Poppy called; they have moved house and are happy in their new place. Poor Ben recently fell off a ladder narrowly missing removing an eye in the process, and really frightening Poppy. He is now sporting a real shiner. We had a peaceful day, and in my new domestic capacity I cooked dinner for a change. Later we sat in the garden admiring the flowers while sunset came, and small clouds were stained pink across an azure sky, swifts were feeding on the wing, and a large group of pigeons circled and turned above us; the sound of their flying was very attractive. It got darker, and leaves were silhouetted against the sky in a very tropical way. Gradually the west filled with a bright golden orange and we decided to go indoors. A perfect and memorable evening and we were content. We had breakfast as usual, and as usual I washed the dishes and generally tidied up. I do not know if the chemo is having a strange side effect on me; I now take enormous pleasure from washing up, and each cup and dish gets polished and put away with loving care in exactly the right place, and I have to force myself to stop cleaning and polishing. This is rather strange from someone who used to agree with Scarlet O'Hara's motto of "I will worry about that tomorrow." I am wondering how far this will go, will I creep down in the night to polish up a few more cups before long? Eventually I tore myself from the kitchen and walked down to Edgware, taking a letter to the surgery en route. It was sunny and hot, and I went to the Broadwalk to get a Radio Times as well before coming home on the bus. Later, managing to steer clear of the kitchen I did a bit of pruning in the garden, and Mas did some gardening too. We watched a couple of Frasiers before turning into bed. Today after breakfast a neighbour called in to see how I was, and bought a large bunch of Carnations for me. People have been so kind to me, and have given me so many flowers but sadly now I find I associate cream carnations with being ill, and find I do not like them at all as a result. 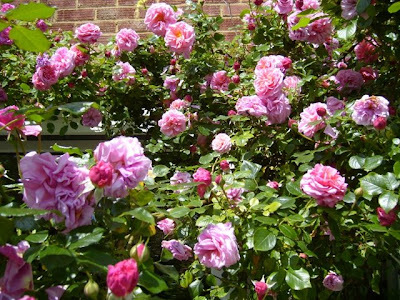 It is a shame because they are lovely flowers and when grown out doors have a lovely warm clove smell that I like. It is odd that I have this antipathy towards Carnations now because my Mother did not like them either; it was not till I was grown up that she told me my father uses to give them to her when feeling guilty about a new indiscretion, and she loathed them. Poor flowers! The postman bought a treat for Mas: Clare had a school project and when completed was posted to Mas .She had written an 'Ode to My Grandfather' for which she got marked by the teacher 25 points out of 30. It was a lovely touching poem, and it was illustrated too. I am going to frame this for him, it is so nice he is being appreciated! My tooth seems a lot better, and later I walked down to Edgware to collect yet another prescription, but feeling a bit tired took the bus home and had another nap. Pete called again in the afternoon and we talked. Diane sent me a cheerful e-card, and I spoke to her as well. In the evening we watched Wycliffe, a detective story set in Cornwall and a Touch of Frost (more detectives), and then to bed. This morning Mas went downstairs to make the breakfast coffee as usual while I finished dressing. As soon as he goes downstairs he turns on the radio and listens to Classic FM to keep him company; if he does not care for a piece of music he tunes it out and just does not hear it, and it does not matter how loud or big the orchestra is that is playing the music. I came downstairs feeling rather chipper as I had not had any drastic effects from the pills I had been taking, and proceeded to pour out the coffees. I handed Mas his coffee, and whistled a couple of bars from the music that was playing so loudly. The effect was immediate, he looked as shocked as if a cobra had risen up and bit him, and gave a visible shudder. I believe he has strange bat like hearing and some frequencies seem to shred his nerves as he claims that I whistle shrilly, and off key, which is obviously unjust. As he complains about me whistling I usually do it from a distance, but I forgot today; the look on his face made me laugh so much that he had to laugh as well. We went off to the dentist again and I saw the hygienist who is a beautiful young girl. I realised as I had this strange phenomena of pins and needles in my mouth, and that my throat would close if she used cold water, so she scaled and polished my teeth by hand. She also said that if we were careful she thought we could save my tooth, and she proceeded to carefully inject antibiotics into the gum, and told me to use salt and special mouth rinses. She could not have taken more care, and I am very grateful for her help. I was especially thankful as I had begun to visualise myself with no hair, a front tooth missing and all I would need would be an eye patch to complete the picture! When we got home and after lunch, Mas cut the lawns and the hedge which is a lot in one day, and I was sorry I was not able to share it as usual. I do find that I have to take a rest during the day now which is something I do not usually do. Mas then went off to get some shopping and Pete and I talked on the phone for a long time and I caught up with some e-mails. We watched a little TV in the evening, but we were both tired and went to bed early. After breakfast, and lots of pills we got ready and Mas took me to the dentist who took x-rays of my implanted tooth and said it had an infection and prescribed antibiotics; he thought it likely that I would loose the tooth. He was very kind and said I could phone him anytime I was worried, and I made an appointment to see the hygienist the following day. We went off to get the antibiotics from the chemist, and Mas collected a little shopping, and we returned home. After lunch I rested for a while, before going into the garden to do some gardening; the easiest kind, removing dead heads of flowers. 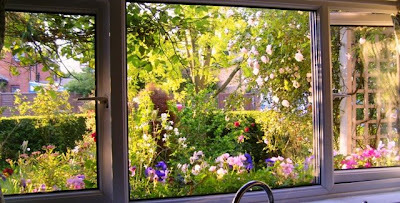 These roses round the window are highly scented and their perfume fills the bedroom above. In the evening we watched The Bill, some Frasier, and I, Claudius, and by mistake we found we had stayed up very late, so went off to bed. Today I went back to the hospital, had a blood test, saw the specialist and began the chemotherapy. The nurses in this section of the hospital could not be better. They explained the procedures with full eye contact and went through the list of possible side effects, were attentive and helpful in every way; the whole atmosphere was very relaxing. I mentioned that my gum had become inflamed and was advised to go to the dentist immediately before my immunity decreased. I was connected to a drip and the process began. Thankfully it was fairly uneventful except that my arm began to feel strange so a nurse bought a mini hot bottle which relieved the sensations a bit. With this particular drug you must keep warm, and in particular not drink anything cold. I forgot and took a sip of cool water and my mouth instantly felt as if it was full of pins and needles, this was relieved instantly by a sip of hot tea. After being given lots of instructions and follow up pills to take at home, and contact numbers to call I left and met Mas who was waiting for me downstairs. I felt a bit shaky but otherwise not too bad. On the way back Mas drove to the dentists and they gave me an appointment for the next day which was a relief. We got home, and Mas made dinner and I found myself really hungry. My arm felt as if it had been rubbed all over with stinging nettles, but I had a hot water bottle to relieve it. I cannot touch anything cool or I get pins and needles in my hands, and I have to clean my teeth using hot water which is odd. We watched some Frasiers and went to bed a bit early. I was glad to have made a beginning as it brings the finish of the treatment closer.